The Update Data action allows you to update a data field for Subscribers. Update Data provides options to set, increment, or decrement numbers and float fields, set date fields to a specific date or the date of the action, as well as set a text field to a specific string. Table: Required listbox to select the Table containing the data to update. Update Data currently only allows data to be updated in the Subscriber Custom Data table. The data update occurs for a batch of subscribers, instead of individual subscribers. This means that if you choose to update the Subscriber Data table first name column, all Subscribers in the batch would be set to the same first name. Relational also cannot be set because it requires a look up field (such as the unique column id) per Subscriber. In the future, this will be supported. Column: Required listbox to select the data field in the Table. This option is populated after the Table is selected. Once selected, other options appear based on the the data type of the column. 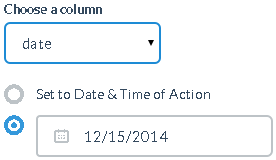 Update Date By: Radio button options that display for columns of type Date. Update Data By: Listbox option that displays for fields of type Number or Float. Select to update data by setting the data field, or by incrementing or decrementing the value already in the field. Update Data Value: Required textbox to define the value to save. The value can be a string, number, or float depending on the type of the data field selected in the Column option. Drag the Update Data action to the workspace. Click the action to display the Update Data popup. Select the Table that contains the data to change. You can choose to update data in the Custom Data table only. Once selected, the Column listbox is populated. Select the Column containing the data to change. Once selected, additional options appear depending on the field type: number/float, text, or data. Number and Float type: The Update Data By field will appear. Select the method to use to update the data: Set Data To, Increment Data By, or Decrement Data By. Once selected, enter an integer or float value in the Update Data Value field. 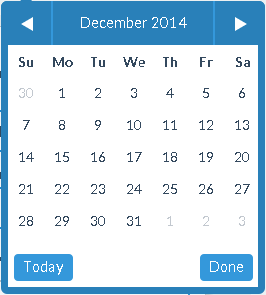 Date type: The Update Date By radio buttons will appear. Select to use the Date/Time that the action occurs, or enter a specific Date to set. Text type: The Update Data Value field will appear. Enter an alphanumeric text string to save in the data field. The saved Update Data action will appear in the workspace with the Table name, Column name, and Value displayed in the action details. If the Update Data action options have not been defined, it will appear in the workspace with a red border. ​Update Data Table is a required field. Please select a valid table. 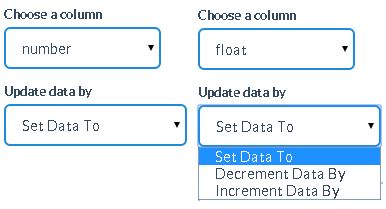 Update Data Column is a required field. Please select a valid column. Subscriber Data and Relational Data cannot be updated. Number fields can store whole integers only. Float fields can store integer or float value. Dates must be entered in the format mm/dd/yyyy. Update the data field for the subscriber. One output point to any other Action type.